Last night I attended my first meetup event with the Boston Gluten-Free/Celiacs Meetup group. 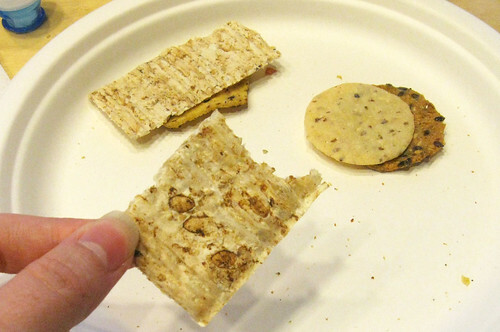 The event was a taste test of sorts, to get our feedback on various gluten free products. 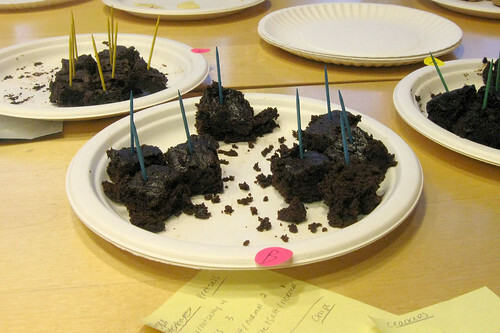 We tested cookies, cracker, pretzels, chips and brownies. The event was organized by Shannon and Gillian who are not only organizers of the Meetup group, but also happen to work for Zeer, the sponsor of the event (and also the sponsor of the meetup group). I'll talk more about that in a minute, but first, some photos! These are Hol Grain Gluten Free Brown Rice crackers. I took a bite and had to check to make sure that I had bitten into the cracker, not the cardboard box... nope it was the cracker. I am not exaggerating. These were the hands-down winner of the worst food item of the night. Of course, the favorite of the night was the brownies! Unfortunately only 1 out of the 5 samples were dairy free, they were made from the Pamela's Chocolate Brownie mix. I thought they were good, very rich, fudgy, and dark chocolate. I actually like the Betty Crocker mix better, but they had prepared them with butter so I avoided them at the tasting. The Pamela's mix actually made me think fudge, not cakey brownie. One of the tasters at the event was Andrea from the Food Should Taste Good company, which I blogged about last year when I met the people from the company at the GF Cooking Spree. 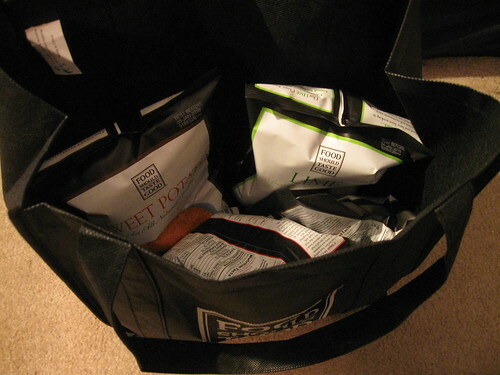 They were nice enough to give us all a surprise bag full of chips!! I love their chips, they are so flavorful and delicious, and have a lot of great varieties. This was a fun event and I met some great people. Especially the folks from Zeer. I have only heard of Zeer very recently through a couple of mentions on some blogs and just checked it out for the first time this week. Zeer is a two year old company, based in Cambridge, MA that is focused on helping the gluten free community to get information on food products quickly and easily. Zeer.com is a database that contains over 30,000 food items and is constantly being updated. You can join for free and search products, but in order to use the advanced features of the site, you must subscribe for $14.95 per month. When I first saw how much it costs to subscribe, I was put off. But after talking with the staff last night, I realized how valuable this resource is. It might seem pricey, but take into consideration that they do not sell any ad space on their website. Their main source of revenue to keep the site running comes from subscriptions. They are constantly in contact with vendors to make sure the site is up to date and not only that, they are also in touch with the consumers. They listen to what we need and want and do what they can to give back to us. These people are passionate about what they're doing. There are a lot of great things in the works with this company and I definitely encourage you to at least check it out!! And yes, I am now affiliated with them, but like I said before - I only affiliate myself with companies that I trust and support and think are valuable resources for the gluten free community. Thanks to Mark, Shannon and Gillian for the wonderful event last night and for the service you're providing!! As for the Boston Gluten-Free/Celiacs Meetup group, I'm going to be an assistant organizer! So if you live in the Greater Boston area, please join us! Hopefully we'll be lining up some great events very soon! How great! They totally need to have one of these things in Houston. Oh- and cute new site! you should start one up!! I am SO JEALOUS!!!! That sounded like such a cool event. And Zeer sounds interesting too. Too bad about the crackers, but good to know! I'll keep an eye in the meetup group in case you guys meet when I'm in town. i totally bought those crackers once and thought the same thing! Cardboard!!! Boston offers so many great opportunities for people. I used to be part of the Vegan Boston meet up. Although I never went, it was a great way to eat well, cheap, and make friends. I'm so glad you met up with some celiacs! Btw. did you guys try Mary's Gone Crackers? They are amazing.